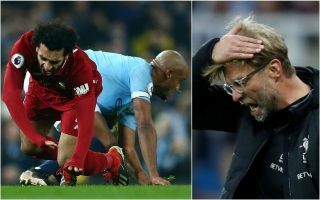 Liverpool manager Jurgen Klopp was not at all happy that Manchester City defender Vincent Kompany somehow escaped a red card in Thursday night’s Premier League clash. The Reds lost 2-1 to City at the Etihad Stadium in a potentially dangerous dent to their title ambitions, with their lead at the top of the Premier League table cut to a mere four points. Goals from Sergio Aguero and Leroy Sane did the damage, though there was also an incident in the first half that could have swung the outcome of the game if it had gone differently. Kompany went in very hard on LFC front-man Mohamed Salah with what certainly looked at the time like a challenge worthy of a sending-off. However, the Belgian stayed on the pitch and put in a great performance, which Klopp reacted furiously to in his post-match interview. The German tactician felt that any harder and Kompany would have put Salah out for the season with that tackle. ‘I really like Vincent Kompany but how on Earth is that not a red card?’ Klopp is quoted in the Daily Star.